Frank Sinatra’s intimate 1958 opus, Frank Sinatra Sings For Only The Lonely, has been newly mixed in stereo for an expanded 60th Anniversary Edition to be released worldwide on October 19th by Capitol/UMe and Frank Sinatra Enterprises. Only The Lonely (60th Anniversary Edition) will be released in a Deluxe 2 CD package, in 180-gram 2 LP vinyl and single CD configurations, and in two digital album versions. A limited edition imported version featuring one bonus track on transparent blue colored vinyl will be issued on December 1st. Starting tomorrow (Fri, Sept 7th), “Angel Eyes” (2018 Stereo Mix) will be available for streaming and for immediate download with digital album pre-order. Only The Lonely (60th Anniversary Edition)’s 2 CD Deluxe package pairs the album’s remastered original 1958 mono mix with a new 2018 stereo mix by Larry Walsh. Four bonus tracks from the mono session recordings are also featured, including studio takes making their release debuts: “Angel Eyes” (alternate session takes – May 5, 1958) and “Lush Life” (session takes – May 29, 1958). The album’s original mono mix makes its digital release debut in an expanded digital collection pairing the remastered album mix with the four bonus session recordings, while the single CD, 2 LP vinyl, and standard digital album configurations feature the album’s 2018 stereo mix. The new edition’s audio was mastered by Ron McMaster at Capitol Studios. 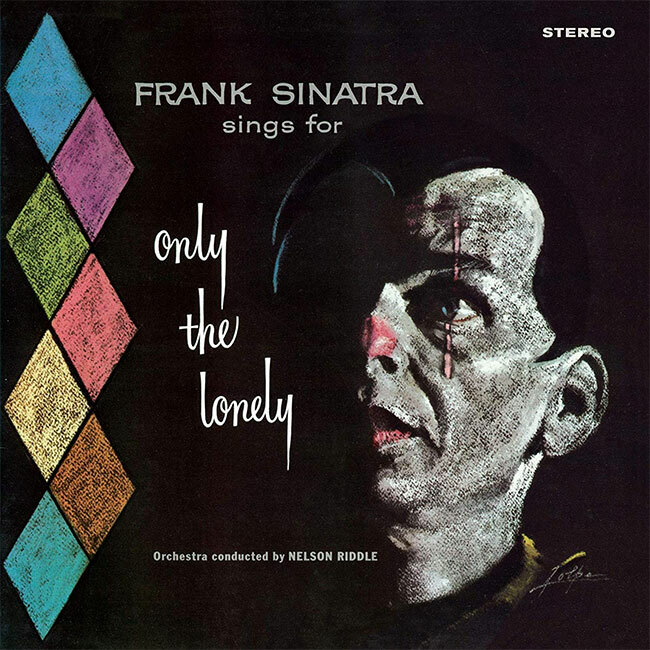 For Only The Lonely, Sinatra recorded evening sessions at Capitol Studios in May and June 1958, joined by an orchestra and his frequent collaborator, conductor and arranger Nelson Riddle. Sinatra delves deeply into love, pain, and loss across the album’s songs of heartbreak and yearning, including “One For My Baby (And One More For The Road),” “Angel Eyes,”’ and “Guess I’ll Hang My Tears Out To Dry.” Only The Lonely reached No. 1 on Billboard’s albums chart and remained on the charts for 120 weeks. At 1959’s inaugural GRAMMY Awards ceremony, the album won the award for Best Recording Package.